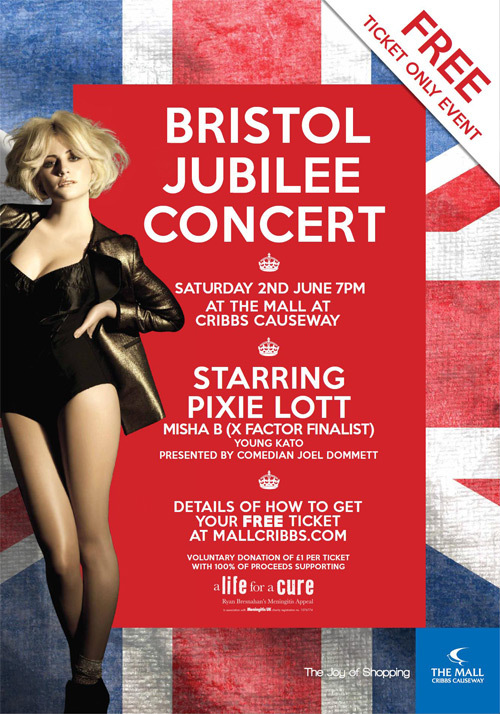 We are delighted to announce that The Mall at Cribbs Causeway are staging a Jubilee Concert this June with “a LIFE for a CURE” as the sole charity partner. We’d like to thank The Mall for their kind gesture and assistance in bringing the cause to the fore. We look forward to seeing as many people as possible at the Concert and hope you enjoy a fantastic event in support of this massive cause! Please remember to make your voluntary donation of at least £1, based on receiving your free ticket to the event courtesy of the Mall Cribbs Causeway. We are pleased to confirm that 100% of all funds will go towards Ryan’s Appeal ‘a Life for a Cure’ and the valuable support it is providing towards research and awareness in ultimately eradicating this devastating disease! It is only with your help will we actually make a difference to other people’s lives! Acres Holt, Valley Road, Leigh Woods, Bristol BS8 3PZ.